Sleek features a clean and cylindrical modern style with soft, flowing lines. Sleek elevates modern to a new level and defines the shape and function of things to come. Sleek also utilizes Reflex technology, a comprehensive system of design enhancements engineered specifically for pull-out and pull-down movement by undocking easily, moving with you and retracting effortlessly when you're done. The Beale MeasureFill kitchen faucet is the first faucet on the market that delivers an adjustable set volume of water on demand due to its unique MeasureFill technology. This innovative technology makes cooking and baking easier and more convenient. It also helps to reduce clutter in the kitchen by eliminating the need of additional tools and still allows for an activation of the faucet through a simple touch on the faucet dial. Concetto Single-Handle Kitchen Faucet Freshly modern the Concetto single-lever kitchen faucet combines a sleek gooseneck design with high-tech functionality. Easy cleaning of big pots: with this high spout, your GROHE tap will master any challenge in the kitchen. The lever handle benefits from GROHE SilkMove technology, which provides smooth and precise one-finger control of water temperature and volume. With its fluid curves and graceful gooseneck design, the LadyLux3 Cafe single-handle pull-down spray head kitchen faucet is as elegant and eye-catching as it is functional. Standing 14 -3/4 inch. tall, its striking profile comprises a high-arc swivel spout that extends 8 1/8 inch. in reach and incorporates a pull-down sprayhead. Locking spray control allows users to switch between 2 spray modes regular flow and spray with a simple push of a button. GROHE SpeedClean protects the spray nozzles against limescale buildup and the lever handle, equipped with a GROHE SilkMove for a lifetime of smooth operation cartridge for smooth control of the water temperature and volume, rotates forward to turn the faucet on, eliminating installation issues relating to backsplash clearance. LadyLux3 Cafe has a 2.2 GPM water flow and comes in GROHE StarLight finish for scratch and tarnish-resistant surfaces for a lifetime of beauty chrome, a brilliant finish that resists scratching and tarnishing. 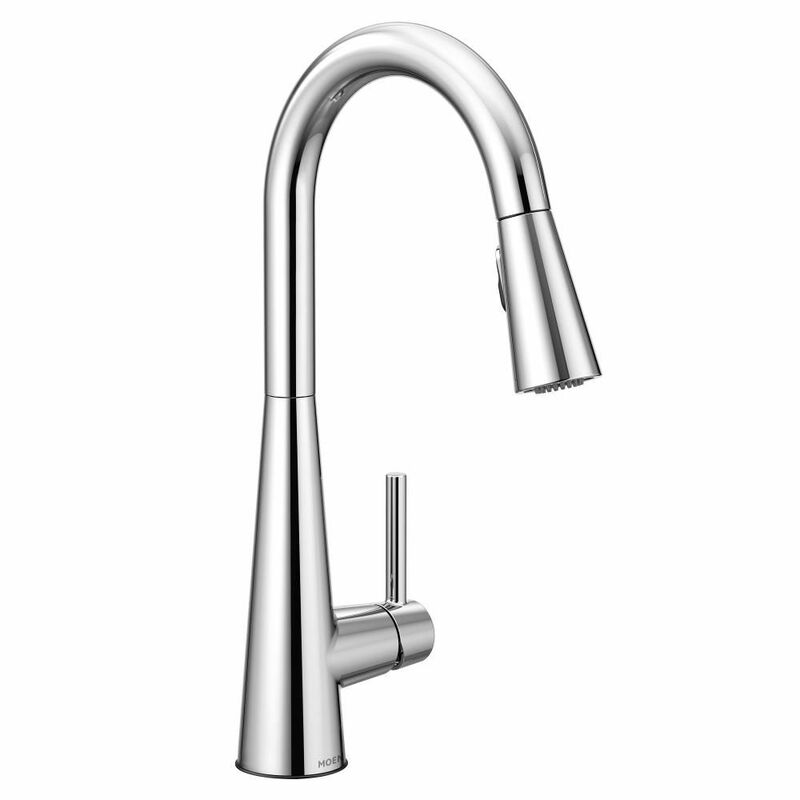 Sleek Single-Handle Pull-Down Sprayer Kitchen Faucet With Reflex And Power Clean In Chrome Sleek features a clean and cylindrical modern style with soft, flowing lines. Sleek elevates modern to a new level and defines the shape and function of things to come. Sleek also utilizes Reflex technology, a comprehensive system of design enhancements engineered specifically for pull-out and pull-down movement by undocking easily, moving with you and retracting effortlessly when you're done. Sleek Single-Handle Pull-Down Sprayer Kitchen Faucet With Reflex And Power Clean In Chrome is rated 4.9 out of 5 by 9. Rated 5 out of 5 by Mary from My plumber told me it was the best choice I... My plumber told me it was the best choice I could have made in selecting a new kitchen faucet. It works well and looks great. Rated 4 out of 5 by Cherylista from Nice styling, water comes out powerfully, can splash.... Nice styling, water comes out powerfully, can splash. Rated 5 out of 5 by Sara from This faucet works very well in our kitchen. In... This faucet works very well in our kitchen. In addition, it has an attractive design. Rated 5 out of 5 by Michael from Excellent.... Excellent. Rated 5 out of 5 by Weedeater from Just what we needed in the kitchen. Works great in the space. Just what we needed in the kitchen. Works great in the space. The &quot;activation method&quot; for this faucet says &quot;touch&quot; but I don't see in the description that it is a touch faucet (ie you can turn it on by tapping it with your hand or forearm). Is this a touch faucet or can you only turn it on using the handle? Thank you so much for your interest in Moen products. The 7864 faucet requires you to use the handle to turn the water on and off. If you have additional questions, please complete the form at http://www.moen.ca/consumer-support/contact-us or call Moen at 1-800-465-6130. Our business hours are 7:30 a.m. - 7:00 p.m. Monday through Friday EST.